Eyelash extensions have been gaining momentum for about 10 years now, but what is a bit unsettling is the need for “eyelash extension corrections”. Normally, the answer this popular question is yes. However, the answer is a BIG NO…when you get a poor application like the “before” photograph shown. What is wrong with the before photo? Picture speak 1,000’s words. What I can share with you is that way too adhesive/eyelash glue was used. This can or will cause irritation. Additionally, her natural lashes were stuck together. If she was not mindful, and sought out an immediate removal then this poor application could of severely damaged her own natural lash hair. Beauty treatments are meant to be fun, relaxing and enhancing. My client was on vacation and had went to a “really good salon”. 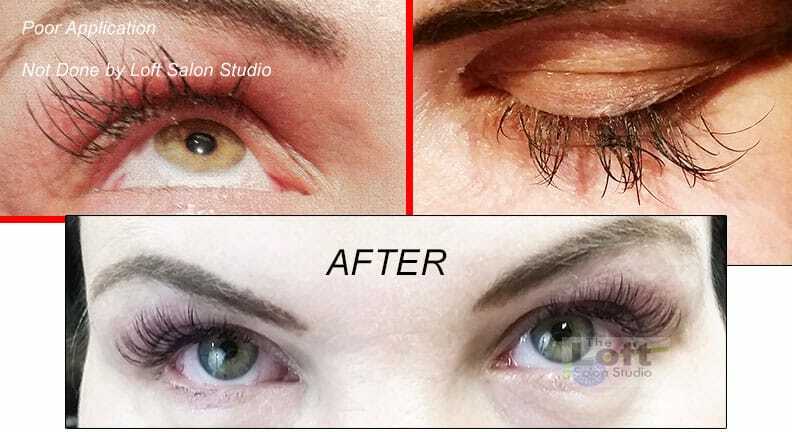 Eyelash extensions is all about precision, and a professionally applied extensions should never be a rushed service. Unfortunately, my clients first experience was not an Xtreme experience but an “extremely disappointing” experience. One professional tip that I can share with you would be to look on a eyelash directory for a certified lash stylist, in your area or go the distance if you find one. Does it answer many of your questions without having to call? Look for ACTUAL PHOTOGRAPHS!!! This tip I cannot stress enough. Just because a site has beautiful stock photographs and a reputable brand does not mean that you can expect to get a eyelash design that will look something like the stock photography. Are they posting up to date photos?